The late, lamented Fametracker.com used to have a column called "Hey! It's That Guy!" which was tailor-made for Chiwetel Ejiofor. Though he has yet to become a household name, his performances have made a lasting impression on anyone who has seen them. He first appeared onscreen as a quiet translator in Steven Spielberg's Amistad, but it wasn't until Dirty Pretty Things five years later that the world stood up and took notice. His introspective, achingly sympathetic portrayal of an immigrant concierge who stumbles into a criminal conspiracy won the actor universal acclaim and a place atop Hollywood's go-to list. He has since worked with the likes of Spike Lee, Ridley Scott, Woody Allen, Alfonso Cuarón, and now David Mamet, who cast him as the lead in his newest film Redbelt. He graciously sat down to chat with the press during the promotional push for the movie. Question: Are you still in the kind of physical shape you had to get in for this project? Chiwetel Ejiofor: I'm not quite in the shape I was then. They had me on a pretty intense schedule. I held onto it for a little bit and I'm trying to get back into shape now. It was actually very helpful for the stuff I did afterwards. I played Othello in London and it turned out to be a pretty grueling schedule, so I was glad to be up for it. Q: How much play does a director like David Mamet give you with the dialogue? Is there any improvisation at all or do you just say, "I'm gonna play it just like it's written?" CE: I actually -- well, I wouldn't say changed things, but we did have some very open discussions about the work and about this character. For the most part David was pretty amenable to that, actually. It was a slight surprise to me, if only because of some of the stuff I'd read about him. But none us knew much about him firsthand as it turned out; it was all sort of speculation and opinion. I was surprised at how easy he was to work with. He was very collaborative and very excited about the project. There was a lot to do in a very limited period of time, but he was still very patient and very engaged in what we were all attempting to do. David was much gentler than I thought he would be. As a person, as a man. He was much softer... until I challenged him to a bit of jujitsu, and then a bit of a harder element came out. Otherwise, it was a lot of fun and I think he was having a great time on the film, even though it was hard work. Q: Did you beat him at jiujitsu? CE: I didn't, actually. (Laughs.) Anybody who knows martial arts knows that as soon as you start, you think you have it all figured out. I was about a month and a bit into the training, and you get to the point where you think you can take on anybody. You know exactly three things and you think that's everything. So I challenged him -- and he's been training for five or six years in Brazilian jujitsu -- and he took off his hat and kicked off his shoes and said, "Come on." We were in the gym on the mat. Then he starts walking towards me, and I remember thinking that he maybe got a little too close to me. He was standing on my foot -- by mistake, I thought. So I tried to move back and then I realized that I couldn't. He had it firm. Then he just smiled at me and said, "You've lost already." (Laughs.) Important lessons there. CE: It's close. It's really close. The heels probably have it, but it's a near thing. Q: How familiar were you with this world, this martial arts world, before you started the project? CE: I didn't know anything about it. Certainly not in terms of Los Angeles or its manifestation out here, and certainly not Brazilian jujitsu and the philosophy that it entails. Everything was very fresh and new. So you start from the beginning, work out who the people are in the jujitsu world and what their philosophy is, and then study and train in jujitsu. That was the toughest part of the process: trying to get some proficiency with the martial art. It was a daily regimen; it started in London at the Roger Gracie Academy. I trained with them for about a month, and then came over to LA and worked with [fight choreographers] Renato Magno and John Machado for another month before we started shooting. During the shooting, with any free time we had and on the weekend, we would train. So it was about three-and-a-half months of intensive training through the whole process. When we started, it was many hours a day, and even during lulls there was exercising and running and such. That was pretty much it, from the moment I put the phone down with David when he asked me to do the job right up to the last day of shooting. Q: What about the philosophy of jujitsu and the connection to that that your character expresses? CE: The big name in jujitsu is the Gracie family. They're huge. They were founded by Carlo and Hélio Gracie, who developed it and brought it to America. I was able to work at the Roger Gracie Academy in London, so there was a very direct link to the whole history of Brazilian jujitsu and the philosophy of Brazilian jujitsu. They keep it very much alive over there, with the way they train and the way they think. I was able to get involved with the Gracie family immediately. Then I came over here. Down the line on Carlos's branch of the family are the Machados, and Jean Jacques Machado, who's in the film, and I was training with him. So again, I was really able to be influenced by a real understanding of jujitsu right from its foundation to the present day. I was able to go see Royce Gracie fight and the old man -- Hélio -- turned up and I was able to spend a little time with him. You get a pretty panoramic view of the art very quickly: where it comes from, what it is, how people live within it, and how those philosophies have been transmuted elsewhere. Q: The film shows a very corrupt world as seen from the eyes of an outsider -- someone who knows the art, but is not a part of that corruption. Does that compare in any way to being a British actor and coming to Hollywood to make movies? CE: Well, actors come into films rather late in that sense. A lot of the fights have already happened by then. Then actors leave at the end of shooting and if there's any fights in postproduction, they happen without the actors being there. We kind of get the best of the Hollywood experience in that sense. I've always had a good time and I've been very happy with the films that I've made here. Of course there's always... certainly not duplicity, but I have never been on a film set where there hasn't been some sort of struggle to get it all up and running. There's always complications and every shoot is incredibly difficult. And if you were to throw duplicitous people into that process -- as does happen in any kind of a business this large -- it becomes very murky at times. Which is why people have a lot of protection in this town in terms of lawyers and their rights and such. For me, knowing that that's all set up and taken care of, I don't have to be involved in that. But someone like Mike Terry [his character in the film] or anybody who's sort of newly arrived in a big industry -- trying to make a name for themselves and not completely aware of how the system works -- they can find themselves very quickly exploited. Q: You've built up a pretty eclectic and diverse body of work. Is there any one thing in particular that attracts you to a project? CE: In this particular instance, it was David. As soon as I knew that David was about to send me the script, I got pretty excited. I mean, I don't know what kind of script of his I would turn down! Whatever was coming, I knew I wanted to be involved in it. I'm just a huge fan of his work. So someone like him is obviously going to make a difference. In more general terms, it's just narrative that I love. Good stories and good characters. All the basics, really. If I'm reading the script and I find myself turning the pages to see what happens next and it's moving for me, then I know (or hope at least) that that's the kind of effect it's going to have on an audience. That's enough for me. 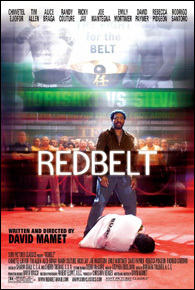 Also read: Rob Vaux's review of Redbelt.